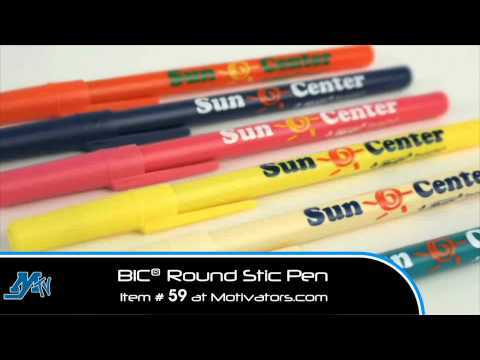 The custom imprinted Round Stic Pen by Bic is the perfect trade show giveaway or convention item. It's the classic ballpoint pen we've known and used for years. The pen has over 200 possible color combinations and is long lasting. Every time your customer makes a note your logo will be seen and your branding power will be felt. Customer Review: Good product, only issue was that the green color was lighter than expected and did not match our corporate green color. Product Usage: Pens work great! Ordered them for a trade show we were at last year and everyone loved them so we ordered them again for this years show. Customer Review: Pens work well and dont run out quick. Write very clearly.